You are viewing chapter 1 of 8. Click this box for table of contents. Hello there, stranger! Let me start by explaining what it's all about - and that should help you decide if this page is what you were looking for. I'm a computer geek by day, and a hobbyist robot builder by night. I quickly learned that the craft of robotics - just like many other precision hobbies - requires either remarkably deep pockets, or a combination of outstanding manual skills and easy access to a well-equipped machine shop. Urban dwelling hobbyists who are not blessed with any of these graces tend to give up, resort to expensive and simplistic premade kits, or fall back to junkyard-quality engineering. 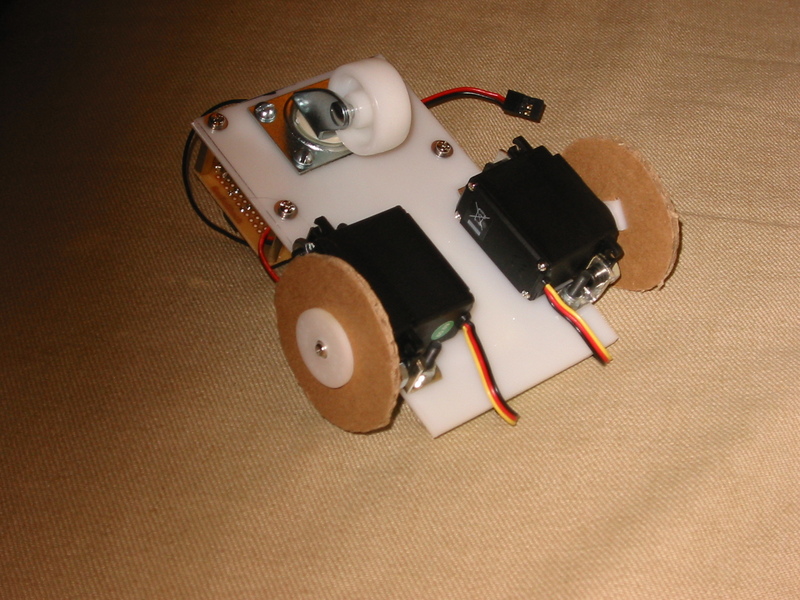 Curiously, the simplest tasks often prove to be the most challenging ones: many of us can program a microcontroller without breaking a sweat, but making a simple actuated joint, a gearwheel, or a cover in a desired shape, can be beyond the realm of imagination. For the past decade, we are being promised a revolution in desktop manufacturing - but unbeknownst to many, a simple, affordable, and home-workshop-friendly solution is already well within reach. The only problem with computer numerical control is that the workflows and materials suitable for small scale, hobby engineering are almost completely undocumented, and quite difficult to discover on your own. The approach also works for others; this hybrid legged robot by Marc Hamende (video) is one of my recent favorites. Section 3: A crash course in CAD and CAM. Section 4: A primer on high-performance casting resins and moldmaking work. Section 5: A library of components for electromechanical projects. Section 6.1: Simple part design technqiues for optimal rigidity and strength. Section 6.2: An introduction to gear geometries and transmission systems. Many of these sections will be applicable to other types of projects and other manufacturing processes - including hand-made and 3D-printed designs. Oh, to get it out of the way: note that this page is pure, unadulterated labor of love; there are no affiliate links, paid product placements, or ads anywhere in the guide. In basic terms, computer numerical control milling is a "subtractive" method for processing raw material (workpiece or stock) with a drill-like rotating cutter (end mill) through a set of multiaxial, computer-driven movements of the cutting head. You can think of it as a robot equipped with a Dremel tool. Some of the most basic CNC mills resemble a drill press on steroids. A growing number of them is designed specifically for home and office uses, and have more sophisticated looks - but still, in comparison with technologies such as 3D printing, which produces 3D shapes by additive deposition, CNC machining seems pretty savage. Precision: when I started working on the guide, this would be a good result from a Makerbot FDM printer; and this would be a more common example. The technology has improved since, but still, if you compare it to output from a CNC mill, the difference becomes obvious. CNC mills often boast mechanical resolutions of 1 µm (0.001 mm) in all axes, and produce silk smooth surfaces for almost arbitrarily complex parts. Right now, the real-world accuracy of a $2,000 mill is usually difficult to replicate with any printer that costs less than $40,000. In fact, even with very expensive printers, there tend to be significant constraints on what you can make: features smaller than 0.7 mm in the X-Y plane, or under 0.1-0.2 mm in the Z axis, are often taboo. Choice of materials: CNC machines work in cheap, commodity materials - anything from wax, to transparent plastics, to PCBs, to wood, to plaster, to aluminum, to steel. 3D printers, on the other hand, are restricted to a small set of proprietary stock, and produce parts that are rarely suitable for demanding applications - chiefly due to poor strength. Cost per part: With the processes advocated in this guide, the cost of making a small part out of high strength, engineering grade plastic, or from tough rubber, seldom exceeds 25 cents; the raw material hovers at about $15 per liter or so (this photo log has a detailed price breakdown). In comparison, the materials used by higher-definition 3D printers oscillate around $300 to $500 per liter; materials for Makerbot and other low cost FDM extruders are closer to $50 - but then, their output is seldom salvageable for precision work. Speed: A typical cutting process takes between 5 minutes and 3 hours on a medium size CNC mill. When it's done, it's done: you don't need to remove intricate supports, wash, sandblast, polish, seal, or post-cure the part. Most additive technologies take much, much longer to produce usable parts of similar size, and almost always require painstaking manual work to get rid of manufacturing artifacts. On the flip side, the fundamental advantage that 3D printers have over CNC mills is that they can often produce basic internal geometries inside enclosed parts - whereas milling can only process the areas for which there is a sufficient cutter clearance. It is not trivial to do that on low-cost 3D printers, though - and the constraint of CNC mills is seldom a big deal: almost everything can be split into halves, rotated, or so. CNC machining is the staple of industrial manufacturing. Keep in mind that almost every mass-produced item - from iPads to soda bottles - copes with this reality in a graceful way. Resin casting is a nifty process that involves creating a mold, and then pouring a liquid, two-component polymer resin into the mold cavity. Once the resin sets, the finished part is removed - and the mold can be used again. This method of replicating parts is popular artists of all trades, but is seldom employed in amateur CNC or 3D printing work. So wait, why am I even bringing this up? You can use just about any material, including some truly exotic choices. Sure, CNC mills can cope with almost everything you throw at them - but you need to obtain a suitable stock, and then tailor the process accordingly. Some materials can be difficult to find in exactly the variety and shape you need. Others can be challenging to machine quickly, especially if you're just making your baby steps with the technology: for example, machining carbon fiber composites or soft rubbers is a real pain. The casting process gives you the option of avoiding the hassle whenever you want: master the workflow for one easily machinable, high-fidelity tooling board (or print your parts in flimsy plastic, or sculpt them in clay); and then make the final part out of rubber, glass-filled composite, low-melt metal, or reinforced concrete laced with rocks. You can customize the apperance of the part, practically for free. There is no need to spend money on a variety of differently colored materials just to make your projects look good. Add several drops of a dye to change the color of a common resin at a whim: want water clear? Opaque turquoise? Or fluorescent pink? No problem at all. You can replicate and tweak parts easily. 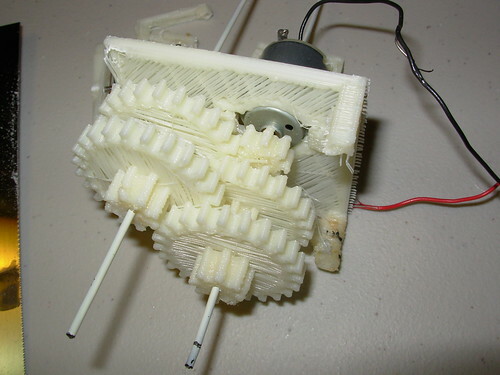 Need to make 50 identical gearwheels? Need to replace a broken part? Need to change the impact strength or flexibility of a component? 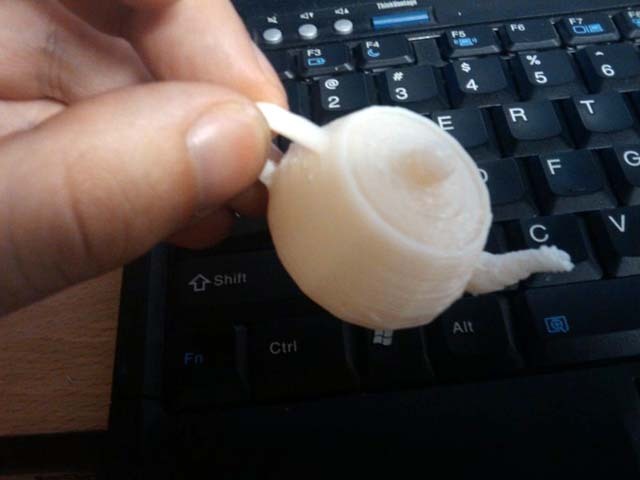 Switch to a rubber that is a bit more squishy or a bit more firm? Just mix the resin and pour it into an existing mold. The parameters of the liquid system can be easily adjusted - again, at virtually no extra cost. You can conserve materials and time. Directly machining parts involves starting with a block of material, and then removing most of it to get the desired shape. This can be wasteful. Mold cavities, on the other hand, can be quickly milled on an almost arbitrarily shaped piece of material - and when no longer needed, can be filled with putty or simply shaved away to make room for the next project. You also don't have to worry about supporting the geometry through the milling or printing process - the bottom of the mold cavity inherently does that job. Best of all, when done correctly, resin casting is essentially pixel-perfect, providing copies with amazing dimensional accuracy and picking details so fine that you can only see them under a microscope. If you want to do any real engineering work in plastics, it is a very good idea to rely on resin casting for a good chunk of your projects - and consequently, this guide is (in part) geared toward this goal. 1.4. But how much will this really cost me? CNC mill: $900 to $3,000 for a sensible unit; around $150 for end mills and collets. CAD / CAM software: $0 to $1,000, depending on taste. Free of charge options are available, and work reasonably well. Resin casting setup: $100 for a vacuum pump; $70 for chamber and hoses; less than $100 for mold releases, cups, and other auxiliary supplies. Media for moldmaking work: $230 for a giant (150 x 50 cm) prototyping board; $120 for two gallons of polyurethane resin; $130 for a pail of silicone. This should last for at least a year. Other tools: $70 for a micron-resolution micrometer; $50 for a micron-resolution dial indicator; $40 for a simple magnifier. For the processes advocated in this guide, the ongoing maintenance costs for a CNC mill are negligible: after several thousand hours of machining, you may have to replace several bearings or spindle motor; cutters should last for hundreds of hours, too. The savings add up quickly, especially if you are already paying for specialty or made-to-order parts.